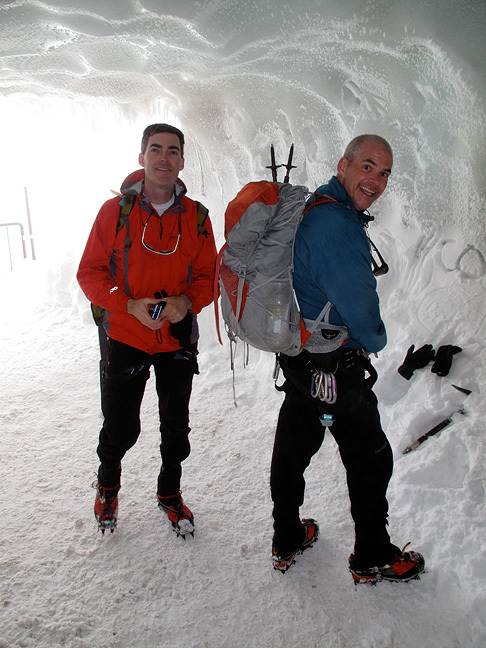 Jim McVey managed to talk his bother Doug into joining him in the Alps for a bit of climbing. Doug is about to enjoy a significant birthday soon (one with a "0" in it) and this seemed like a perfectly sensible way to celebrate. After weeks of dry and sunny weather, the McVey boys arrived with the inevitable storm. 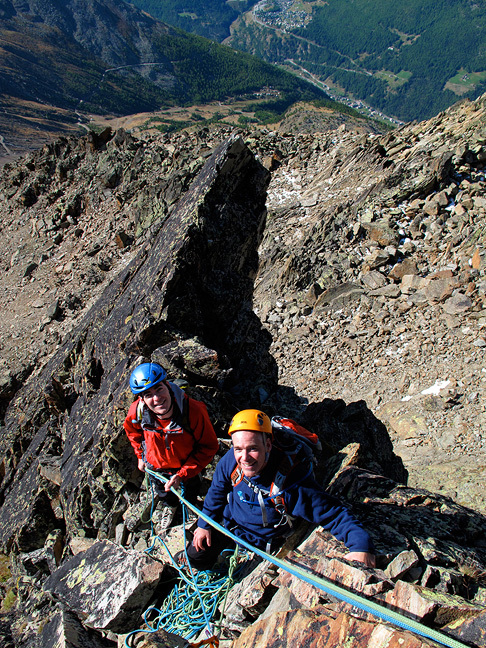 But, by fishing around a bit, and zipping from Zermatt to Chamonix on our second day, we managed to get in a bit of climbing every day. The day prior to our first was truly wet. 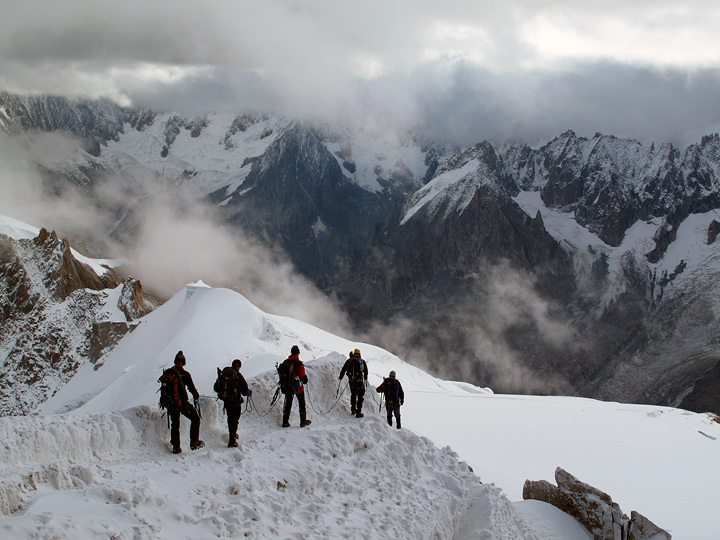 Much snow fell in the high mountains and conditions were tough. Fortunately for us, the forecast for our Day 1 was cloudy but mostly dry. 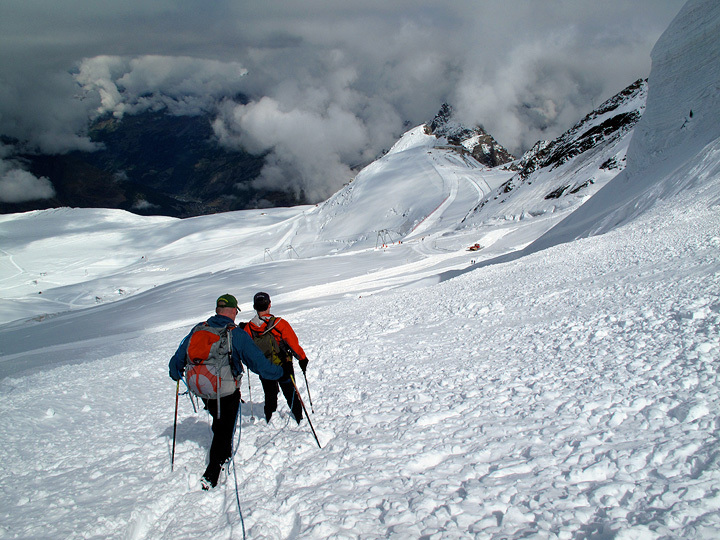 We decided on the normal route of the Allalinhorn, climbed out of Saas Fee. 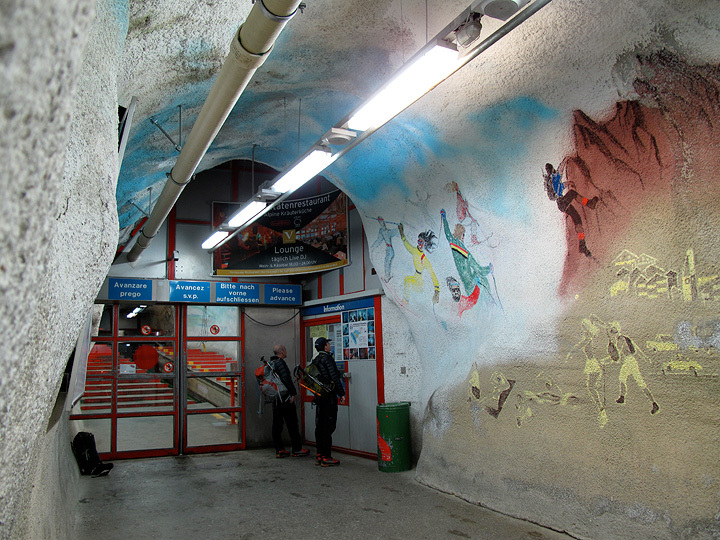 The "route" starts with a ride up the Saas lift system, a couple of cable cars and the Metro Alpine, a mountain subway. Here, Doug and Jim read the latest news. There was quite a bit of new snow, as much as a meter in some places. 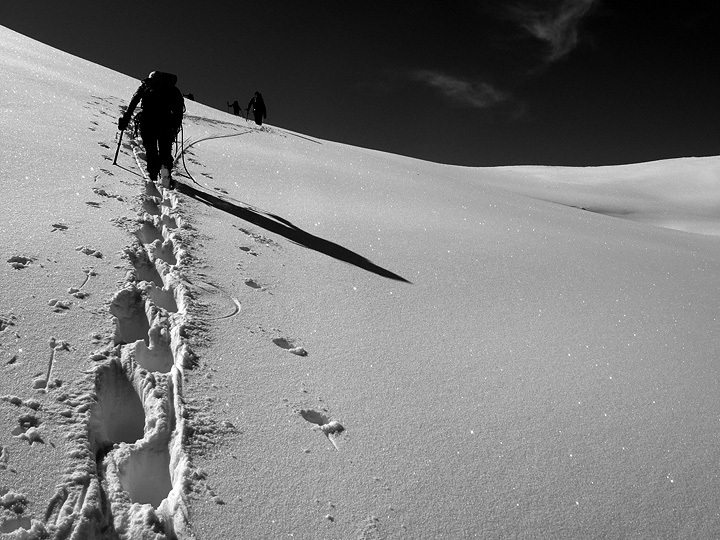 Fortunately, most of the route is relatively low angle and we didn't have to worry too much about avalanche conditions. There were two other teams on the mountain that day, just ahead of us, breaking trail. 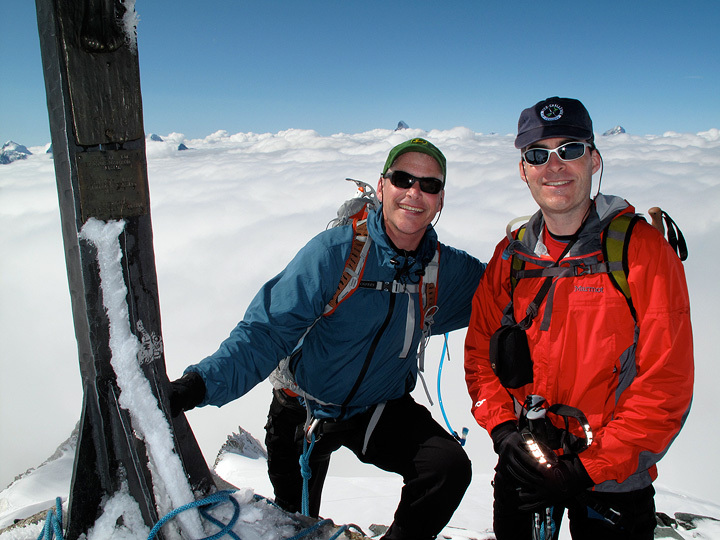 On the summit of the Allalinhorn with a sea of cloud below. The Matterhorn pokes up above Doug's head. 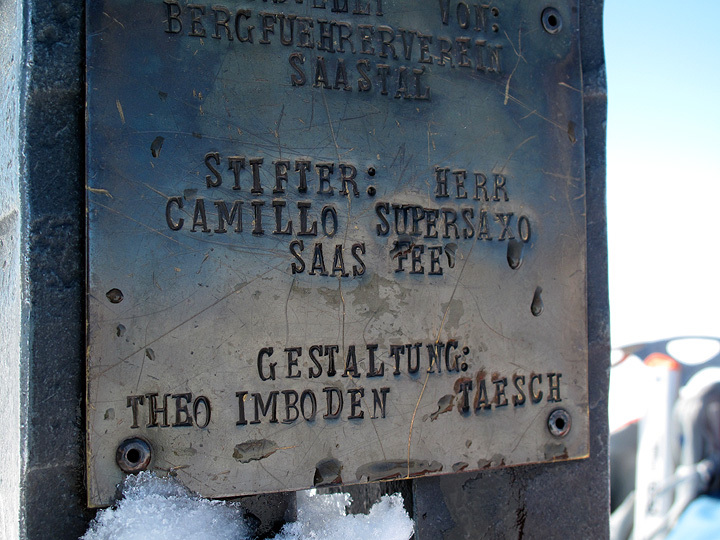 This is an old sign riveted to the big cross on the summit. Aparently Camillo Supersaxo guided Doug and Jim's parents up the peak several years previously. 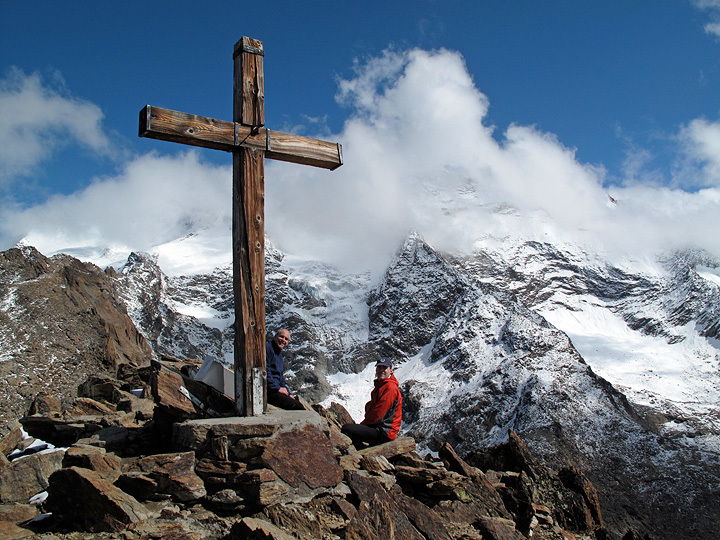 It seems he was an important donor for the Allalinhorn cross-raising project. Descending back to into the ski area. Because of the all the new snow, the ski area was closed this day, so we avoided one of the more objectionable hazards of the tour, that of getting hit by a wayward skier. 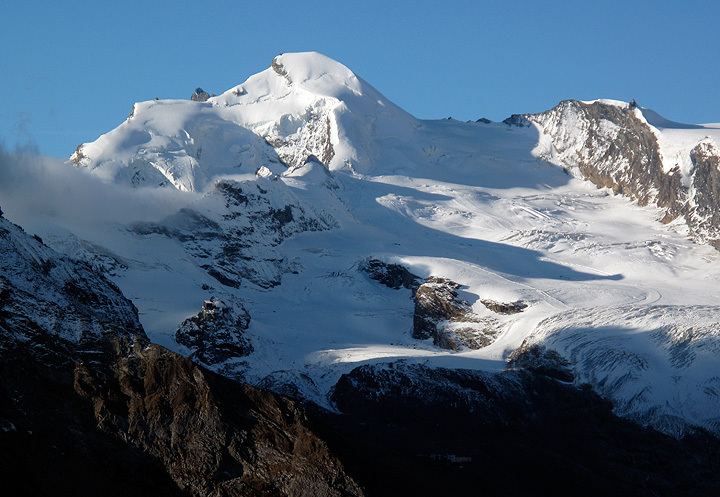 The Allalinhorn as seen the following day from across the valley. Roll your mouse over to see the route. The following day was also sunny, but cool. A rock route was in order. 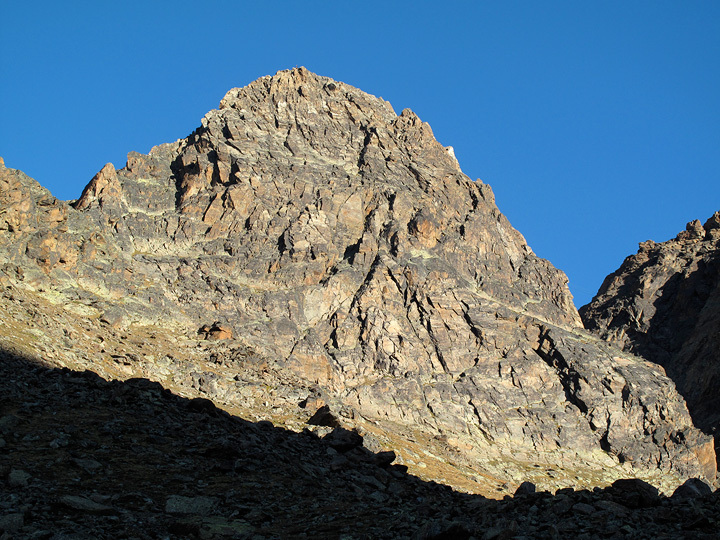 We climbed the Southwest Ridge of the Jegihorn, closely following the left-hand skyline in the photo. Jim and Doug on the route. And on the summit. Behind is the snow and cloud covered Lagginhorn. 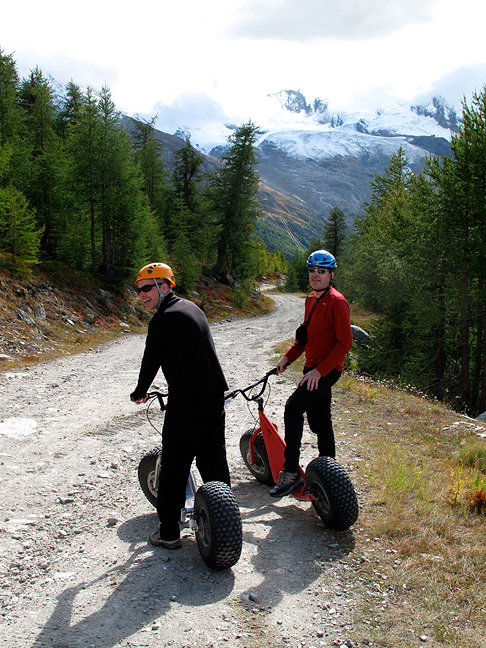 And just for more fun, we rode the "Monster-Trotti" down to Saas Grund. After our bruising ride down, we returned to Chamonix. On day 3 a funky forecast had us concerned about afternoon rain. 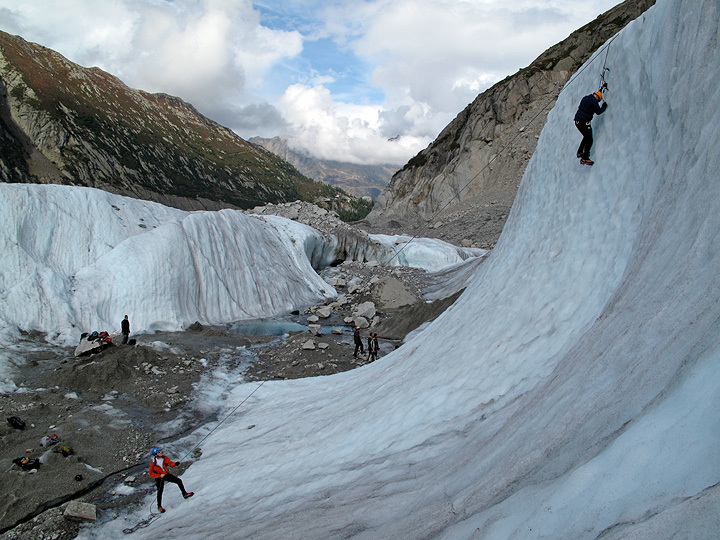 But our day climbing ice on the Mer de Glace stayed quite comfortably dry (except for the hands). 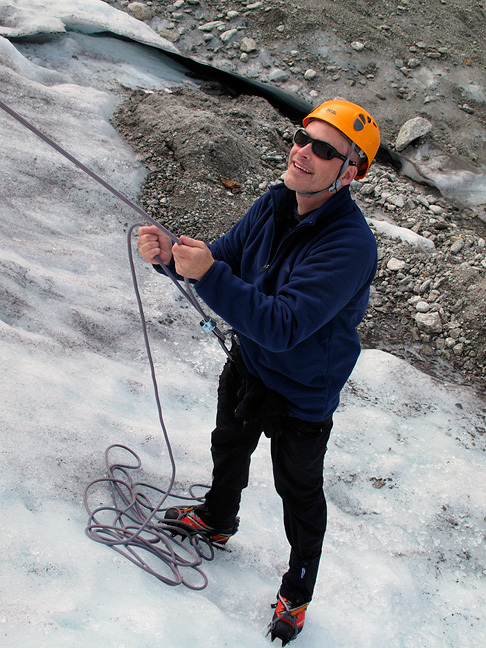 Jim prepares to do battle with the ice as doug belays. Doug, ever attentive, but still smiling. Now its Doug's turn on the wall. 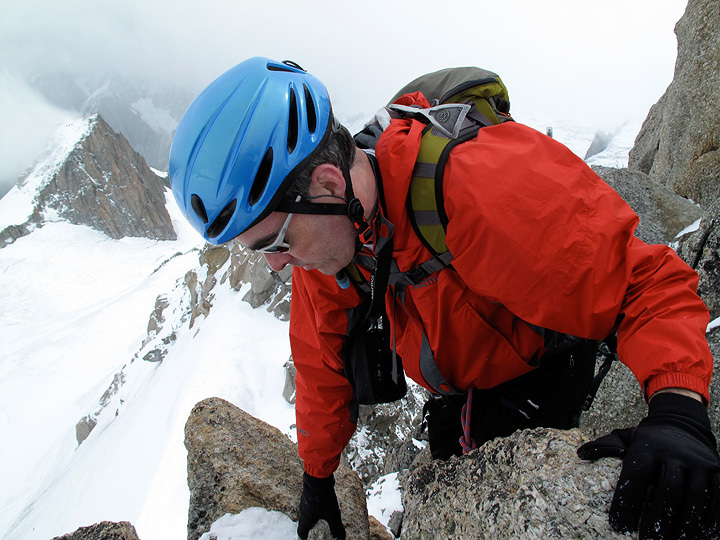 On our last day we opted for a Traverse of the Pointes Lachenal. The weather proved to be a bit less than ideal but the precipitation held off until we were comfortable back in town. 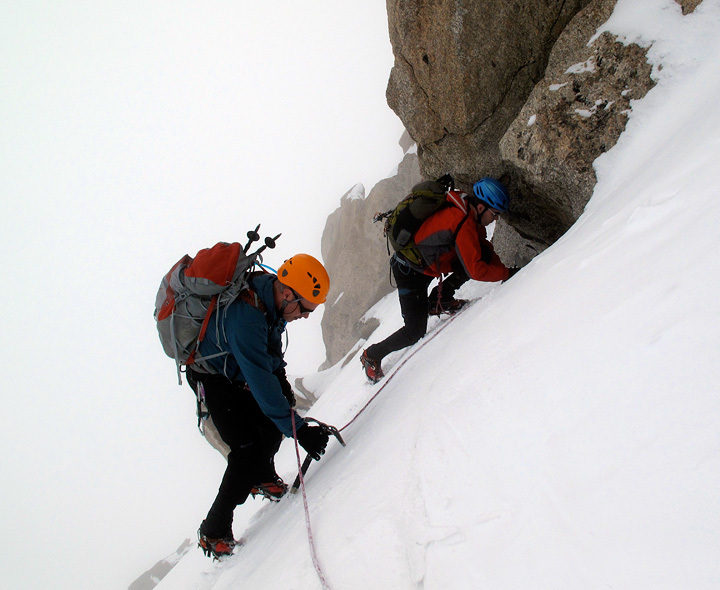 Here another group heads down the arête descending off the Aiguille du Midi. The fog rolled in mid climb. 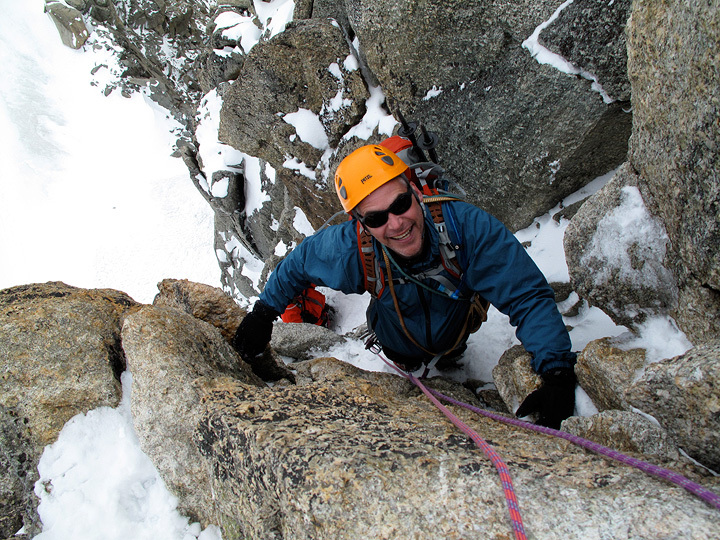 Doug and Jim on the icy traverse approaching the rock pitches. 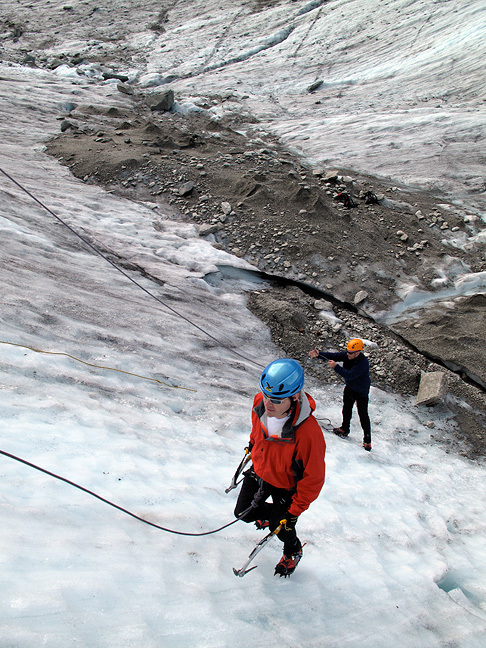 On this route, there are a couple of tricky rock pitches. Here Doug tops out of the upper pitch. Only a short ways below the summit. And Jim not far behind. Back in the ice cave on top of the Aiguille du Midi, heading for the lift back down in the valley. We finished the day with a very fine meal in the restaurant Le Panier de 4 Saisons, joining Kathy and her client, Mark, for an end of season (Kathy and Mark's at any rate) celebratory dinner.